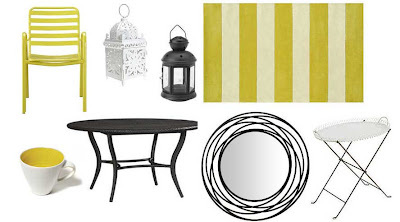 i was thinking last night that i haven't posted anything decor-y in a little while, and was planning a short n sweet post for it today, when voila, what was posted on one of the first blogs that i'd visited this morning? balcony decor! and gorgeous balcony decor to boot! if you ask anyone i know, i have a severe weakness in my heart for anything patio or balcony related - likely because i don't have one of my very own. 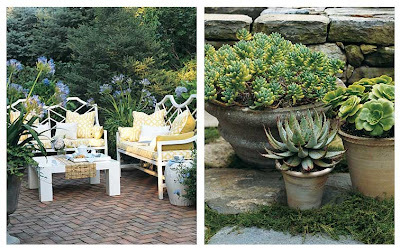 while shopping, you can constantly find me in the garden & patio section of stores, gazing longingly at the chairs, recliners, pots and plants. one day, i'll have a container garden. and a patio and/or balcony. mark my words. thanks for posting my collage of items, love! i'm also inspired by the plants you posted. I love balcony decor too, but I'm so affraid to shop for it...I know I'd go crazy and then there'd be no room for people out there. great inspiration pics! i have to do our balcony this year... its looking a tad sad at the moment! I hope you can have your own deck one day, a nice big one going out onto a bright green lawn. It sounds like something you've wanted for a while and something you would really appreciate! Oh, I wish I had an outdoor area too! I have somewhat of a yards but my dogs pretty much would never allow for anything as beautiful as the spaces in these photos. Container garden = awesome. I love that weird yellow-green color - it my latest fave. I totally rented my apartment for the balcony. I love it. I don't think I'll ever be able to move because I wouldn't be able to find one I like this much. It's such a refreshing site :) I love the idea of a container garder. Can you do those indoors too? I was smitten with that collage too. I love all the plant containers. 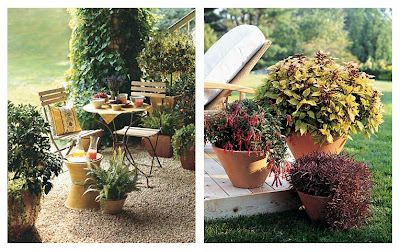 Once again you have an eye for the pretty things in life...After seeing this I might have a soft spot for patios too! and i'm in love with this little bloggy-cyber-space. i'll be back again and again!